I spent the evening penning invitations, Christopher Plummer singing Eidelweiss in the background. Buy a wedding invitation kit with a 50% off Michael's coupon ($15). Print or handwrite the text. 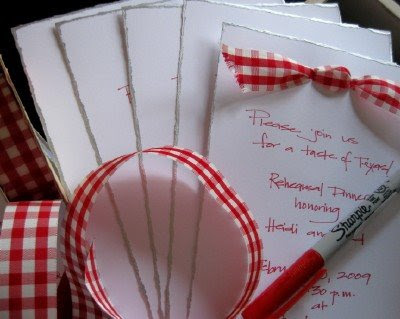 Use the ribbon insert as a template for your own coordinating ribbon ties. Remember that 99-cent bag of ribbon ? I seriously can't believe that you hand wrote those invitations! You have lovely handwriting. Those of us who still write like 3rd graders would have to rely on technology! I know that printing in a lovely font is better (and more consistent), but it takes me longer to fiddle with the margins, etc, than it does to sit down and write the invitations. I can usually find a set of unused invitations at a thrift store or yard sale, but this time I needed too many to go that route. You cardmakers among us probably have ideas for making this even cheaper. I couldn't find cardstock and envelopes cheaper than the kit. Personally, I think handwritten is nicer than computer-generated print. Even if you don't do calligraphy, a calligraphy pen (felt tip "cheaters", not the ones that are dipped in ink) is also a good choice for writing out invitations or addressing envelopes. Are you and your husband hosting the rehearsal dinner? If so, will it be catered or are you preparing the food, centerpieces, et al???? I did dishes watching the sound of Music on TV. It was so wonderful. I do remember when those movies were the most excieting tv event. I love the hand made invitations. Yes, I remember when watching the Wizard of Oz and Sound of Music was a treat for the whole family. Beautiful job on the invitations! I loved the Wizard of Oz on tv. I think they used to play it around Easter every year and I'd get so excited! Wow. I'm in total awe that you would hand write that many invitations. You are an excellent friend for being willing to do that. Our local craft store offers up 50% off coupons each week. I think I would have used one of those to purchase some velum (sp?) and then ran them through my computer, four to a sheet. I tend to stock up on paper and cardstock when it goes on 75% off clearance at the same craft store. What does it matter if it is 'last season's' designs? The people looking at my layouts five years from now will have no clue. You can't beat the .99 cent ribbon. I wish with all of my heart my thrift stores turned up more than loads of old plastic McDonald's toys and way overpriced clothing, lots of which should have gone to the rag pile. One thing I am hoping to find on deep after Christmas discount is cloth ribbon. I received a gift very simply tied with a real cloth ribbon........and was instantly hooked! Love that you printed all those invites! That is such a personal touch. Oh, and your handwriting is beautiful. I remember as a kid watching OZ and Sound on tv. Loved it then. We now live in an "oz" town so I can do without the Wizard. Who are you hosting the party for? They are beautiful and so festive! I love your handwriting. I did our baby announcements w/Target invitation kits and a laser printer and it does take fussing w/the margins. I loved printing our holiday card envelopes that way though! If I recall my etiquette history correctly (never a sure thing), I believe that hand-written invitations were once the order of the day and as commercial printing became more accessible and affordable to the masses, using it was considered not quite the done thing. Hand-inked invitations became less the realm of necessity and more the product of a gracious hostess. These days, I'd be super impressed to receive such an invite - just knowing that my hostess took the time to do what you've done would set my mind for a very special party, indeed! e-vite, schmee-vite - hand-written is where it's at! I love your handwriting! What a great idea. My goodness Merdith, those invitations are just lovely. Wish my printing looked as nice as yours. I am a card maker and I LOVE them. :) Even if I had printed them on the computer, I would have probably gone with some kind of handwriting font and it would have looked just a great as the ones that you did by hand! Those invitations look great! I'm a fan of handwritten things. Those are beautiful and so special! this is my first time here and I felt the need to comment. Your blog is great... I love all the $1 ideas. The Little Debbie buche de noels are so cute! A Texas getaway in February sounds like fun. Are you hosting the rehearsal or just helping your mom with the invitations? I hope it will be a fun event for all! I too miss the exciting family event of The Wizard of Oz on TV! We used to pop popcorn and bring our sleeping bags in the family room. You always render that special personal touch - and we love it! I've been praying to the almighty God that I'd find such a special deal as a $1 dollar bag of fine ribbon! You are soooo lucky to have found that! Can't wait till Spring - YARD SALES! WOOOOOOO HOOOOOOOOO! Meredith, they look GREAT!!! Very exciting! I remember the very first time I saw the Sound of Music! Those commercial breaks were excrutiating. I remember just thinking it was all so wonderful! Dancing around to pass those commercial breaks, humming all the while! I got to go on the Sound of Music tour when I was in Austria in college. So neat!